This page is about the salvia plant known as salvia apiana. 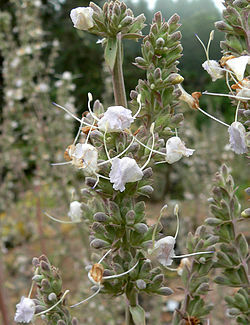 It is also known as white sage, sacred sage and bee sage. It belongs to the salvia genus which also includes common sage and salvia divinorum. It is native to northwestern Mexico and southwestern United States. It is mainly found in the western areas of the Sonoran and Mojave deserts of Baja California and the coastal sage scrub areas of Southern California. White sage is available in the form of smudge sticks, incense, essential oil and liquid extract. White sage contains eucalyptol, eucalyptol is found in many brands of cough suppressant and mouth wash. Researchers from Germany conducted a study involving 152 patients with sinusitis. The research found that subjects treated with eucalyptol had less frontal headache, headache on bending, sensitivity of pressure points of trigeminal nerve, rhinological secretion and nasal obstruction. Salvia apiana is thought to be safe with known side effects.